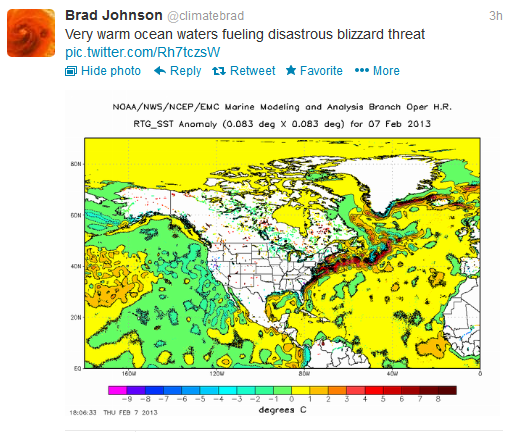 Propagandist Brad Johnson of 'Forecast the Facts' tries to make the pending East Coast blizzard about the ocean 'warming' – Fails | Watts Up With That? Its also a model reanalysis of anomaly, not the actual sea surface temperatures. And this is verified by the WeatherBell SST map showing temperature of 7C to 11C off the coast. That’s not warm at all. Somebody take this fool’s Twitter account away please. According to Mr. Joe Bastardi, this storm is a close analog to the 1969 “Lindsay Storm”. Conditions very similar. Bill McKibben, convinced before he was unconvinced. Brad convinced then even more convinced. It’s okay, guys. We know the drill by now. I’m guessing that the Eastern US must have had a bunch of hot water offshore to produce the Great Blizzard of 1888. Brrr. Imagine if they’d had climate change and extreme weather back then. Sydney, recently in the news for an “extreme”, was so dry in 1888 that the low rainfall record still stands to this day. But at least they didn’t have climate change and extreme weather back in 1888, right? Stupid great-grandparents didn’t know how easy they had it! So what was the water temperature and co2 concentration when this blizzard hit the northeast? The Great Blizzard of 1888 or Great Blizzard of ’88 (March 11 – March 14, 1888) was one of the most severe recorded blizzards in the history of the United States. Snowfalls of 40-50 inches (102–127 cm) fell in parts of New Jersey, New York, Massachusetts and Connecticut, and sustained winds of more than 45 miles per hour (72 km/h) produced snowdrifts in excess of 50 feet (15.2 m). Railroads were shut down and people were confined to their houses for up to a week. Drifts were reported to average 30–40 feet (9.1–12 m), over the tops of houses from New York to New England, with reports of drifts covering 3-story houses. The highest drift (52 feet / 15.8 metres) was recorded in Gravesend, New York. Fifty-eight inches (1470 mm) of snow was reported in Saratoga Springs, New York; 48 inches (1,200 mm) in Albany, New York; 45 inches (1,100 mm) of snow in New Haven, Connecticut; and 22 inches (560 mm) of snow in New York City. I live in Ct. and I have yet to hear a single mention of this blizzard in the media. Probably because they would have to moderate some of the hype. Every storm, big or small, can now be magically transformed into “…the biggest paycheck, EVAH! All it takes is a firm grip on P.T. Barnum. Why do you listen to this drivel? He should just admit he was recently turned into a Newt…. God I love Monty Python, between them South Park & the Simpsons you have some of the greatest quotes of mankind…. We have two generations unaccustomed to weather that was common 30-40 years ago. From Sandy through this winter we see earlier weather patterns common in the 60s and 70s. Not convinced that taking away his Twitter account is the best route…that’d be censorship. I vote for him to have several, help spread the inane word. Nothing like good advertising to torpedo a bad product. Intelligence. One might presume. In 140 characters or, well, you know, less……. Hi Guys, a little off topic, but wondering if some of the scientific minds on here can clear this up for me. Along with many other apects of CAGW I am skeptical about, I find the references to the 160yr instrumental temperature records as empirical data erroneous. Apart form the obvious issues with station siting brought up by Anthony et al and the fact that these records were never meant to be highly accurate I fail to see how a tube full of mercury with a tape measure stuck to the side can be considered anything but a proxy for any changes in the total energy mass stored in our planet and it’s atmosphere? After all, isn’t that what we are looking at? An energy imbalance as some put it? Where the temperature we feel as humans is simply a byproduct of total energy in verses total energy out? My understanding of temperature is that it is simply a measure of potential for heat energy to travel from one object to another? Isn’t this somewhat like trying to calculate the enery in a moving object without knowing it’s speed or mass? I watched the initial rottion for this system start as it crossed Mobile Bay today…. no gullf “stream” involved. Just a cold core low. I’d like to help out but I’m not sure what BB did ask. My suggestion would be for BB to find the search box on this and several other sites and read for a few days. I recall numerous temperature/thermometer/records posts. Three cheers for the Golf Stream, that makes St. Andrews playable. Barely. There is a 70% probability of cold temperatures/icy conditions/ snow between 1600 on Monday and 0800 on Friday in parts of England. This weather could increase the health risks to vulnerable patients and disrupt the delivery of services. Please refer to the national Cold Weather Plan and your Trust’s emergency plan for appropriate preventive action. Cold weather during the winter – Mummy I’m scared!!!! The weather is the new boogey man for these folks. They can’t sleep at night because he’s hiding under the bed or in the closet. Every squeek of the old flood boards or rafters is proof of his existence. Cry for mommy to turn on the lights and make him go away. Every storm is proof of AGW and the sins of man. Cry for the politicians to make it go away! They really ought to get themselves some therapy. Like it or no, there has been a persistent warm anomaly in the NE Atlantic along the coast of New England and Labrador for the past few months. Your basis for a claim that the warm anomaly falls apart? 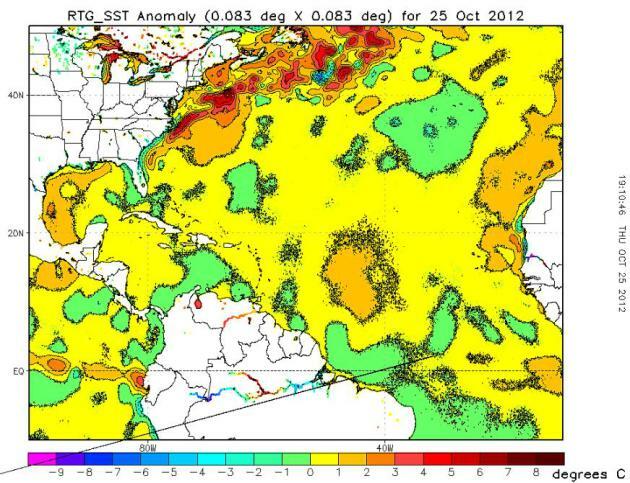 A map of the absolute SSTs. Of course it is cold in the NE Atlantic, it is winter. The point is it is actually relatively warm, as an anomaly chart shows. Monty Python, eh? I watched ‘The Holy Grail’ the other night and the ‘Black Knight’ is a perfect analogue for the whole foundering CAGW edifice. Ocean SST globally is on the low side. 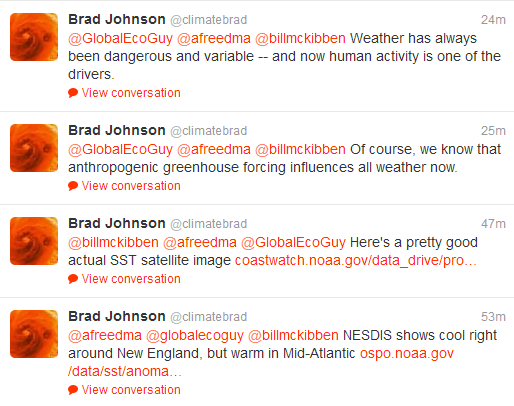 However for Brad Johnson, “very warm ocean waters” locally of the NE USA means the same as “very warm ocean waters”. Sorry, I could have been clearer. When I said: “Your charts are of anomalies”, I was referring to the chart with the caption “Ummm, that’s the Gulf Stream Brad. It looks like that on a regular basis, for example, this one from October 2012:”. Your final two charts don’t show anything other than it is cold in winter in the NE Atlantic, and speaks nothing of the anomalies and the anomalous warmth in that region at the moment. While Brad Johnson is obviously wrong to claim that the waters off the east coast are ‘very warm’, aren’t you also in error? Ummm, that’s the Gulf Stream Brad. It looks like that on a regular basis, for example, this one from October 2012: If it normally looks like that, it wouldn’t be an anomaly. This may be slightly OT but relates to advocacy. In yesterday’s Senate confirmation hearing for CIA director, John Brennan said, and I paraphrase, that the CIA’s job was to provide intelligence to policymakers without advocating any action because if they became advocates then they would lose credibility. This would be good advice for climate scientists. I have been unable to find a transcript of the hearing, but that would be a good quote of the week. ….They really ought to get themselves some therapy. Can we call them thieves yet? 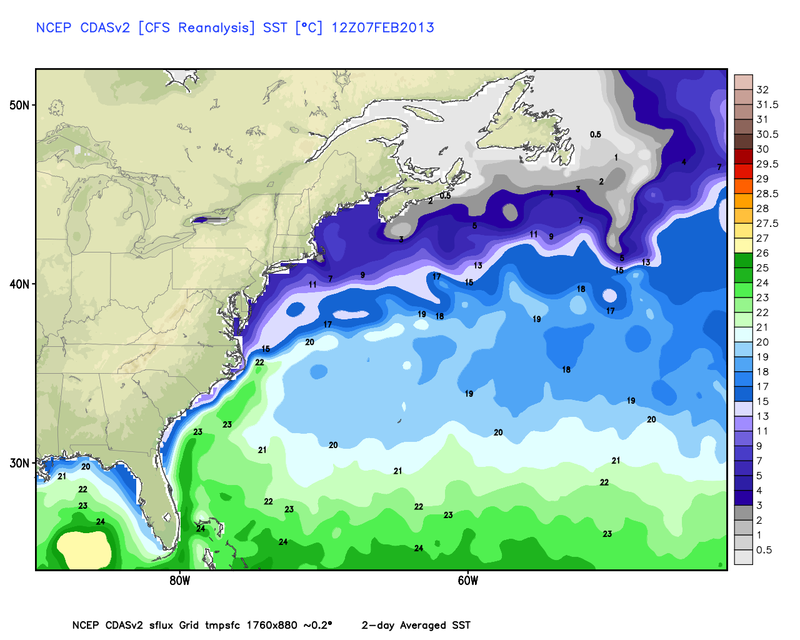 According to the anomalies map, large sections of the gulf stream are > 20 F warmer than average. This seems unreasonable to me, but I haven’t really looked at it in detail. Does this seem odd to anyone else? Or is the X axis of this anomalies map in 0.083 degree increments? That would seem more reasonable. 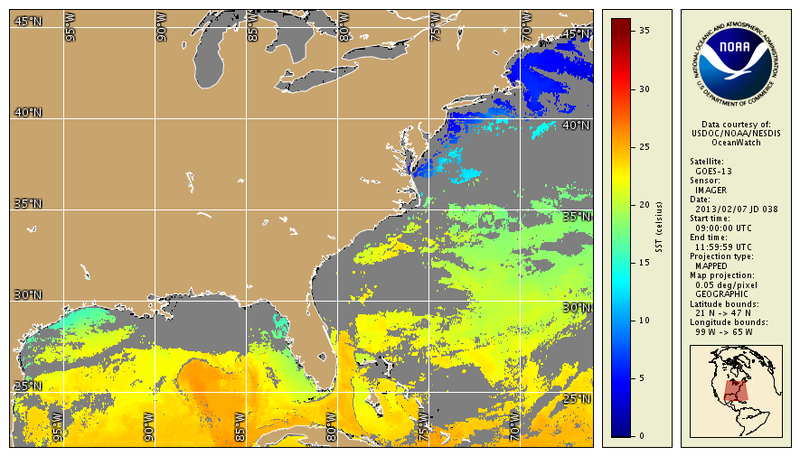 A map of the absolute SSTs. Of course it is cold in the NE Atlantic, it is winter. The point is it is actually relatively warm, as an anomaly chart shows. Ah yes the 60’s and 70’s, wasn’t that back when we were heading into the next ice age??? I grew up in Western MA. I remember some pretty good snows in the 60’s when I was just a young lad! Until now snowfall in that region is about half of normal. How can that be if AGW causes more snow. Oh, my bad, AGW causes less snow before it causes more snow. I get it. Weren’t we heading for an ice age in 1978? NAH, not really, they already knew about climate cycles. by Hays, Imbrie, and Shackleton, had been published. That was the scientific end of the subject. Of course it is the political end that is the real problem. On April 22, 1970, [Lenin’s Birthday] noted anthropologist and outspoken environmentalist Margaret Mead inaugurates the first Earth Day, an event to increase public awareness of the world’s environmental problems. Elaine Dewar wrote in Toronto’s Saturday Night magazine crediting Maurice Strong with starting the Global Warming Hoax. The other interesting tidbit is this 1975 article in Science News vol. 107 Climate Change: Chilling Possibilities I guess they did not get the propaganda change notice in time to stop publication. Here in central NH, the ground has been pretty much bare the past few weeks, after a January thaw, along with a bunch of rain. Since then we’ve had plenty of Arctic cold, and the occasional “Clipper” type system zipping from west to east, mostly just giving us a dusting of snow. I imagine True Believers like Johnson can “see” the human fingerprint in all of that – the fairly low snowfall through a good part of January, then the thaw and heavy rain, then Arctic cold, and now a blizzard. It’s just New England weather though, of course. The ocean does keep things interesting. I was thinking of the other T word. Actually it is a catch-22 for Brad. If the sea off the New England coast is warmer than normal by “8C” then that shows the oceans are exporting heat to the poles at a very rapid rate. Exporting heat means cooling not warming and he just pointed out one of the earth’s feedback systems that keep the temperature moderate. As you’ll see, there’s nothing unusual about them. OOPS sorry, I forgot that that is also what warmists do. Bob is the guy who has been studying ENSO and the oceans closely and is not connected to anyone. Nothing too unusual here in western New Hampshire – we’ll probably get about a foot of new snow (great for the skiers and snowmobilers!). I’ll have it snow-blown off my driveway and walkways around my house in short order. We’ve had MUCH bigger storms in the past. It IS funny to see the climate scaremongers beclown themselves about a relatively ordinary New England Nor’easter. Heck, the Weather Channel’s even named it NEMO!! (Not that I take the Weather Channel seriously anymore). I wonder how many will go skinny dipping in the “warm” ocean? That’s why he has a twitter account, because he is a twit! Except when the author of the anomaly chart explains how and why he’s created the graph–though I do like the word chartsmanship. As the Gulf Stream passes NE, it no longer has a relatively constant position. It meanders and sheds eddys. This makes anomaly maps a bit difficult to look at, as a shift in the position of the GS will produce an anomaly. That’s how you get deviations from “average” that are so high. You’re dominantly looking at shifts in location, not changes in value. Unfortunately, they didn’t show the wind patterns in the North Atlantic. When will the fright mongers get out that current weather events have no relationship to climate trends? The warm “anomaly” off the New England coast is there because of a relative lack of cold arctic winds blowing offshore there recently. That’s weather. No other explanation is required. AGW can selectively warm certain parts of the ocean? There is snow forecast for London, Paris and Milan. Should have a effect on public perceptions of AGW. 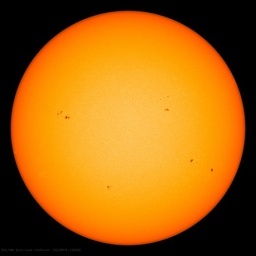 The AGW’s should quote Groucho: Who are you going to believe, me or your lying eyes? Let’s collect all these yahoos and put them in a dome on Mars where the weather is always controlled. It’s the only plade where these “unexpected” weather events would not happen. 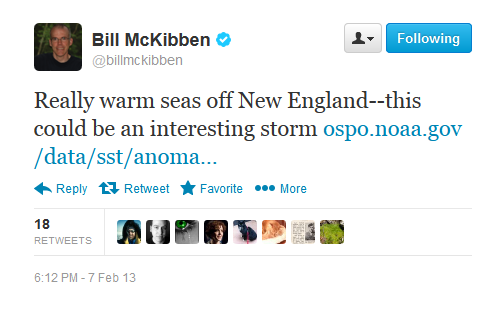 Did Bill McKibben have An epiphany? 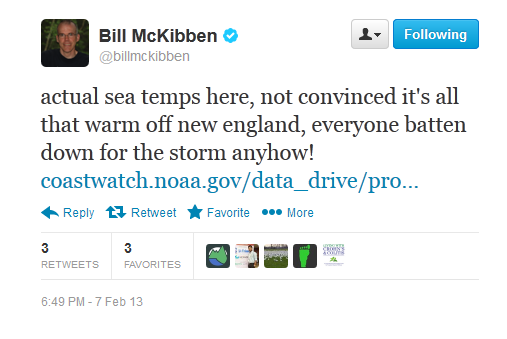 Bill McKibben is a WRITER, not a SCIENTIST. He only THINKS he’s a scientist, and pretends to have a clue. Too much snow or rain? Global Warming! Too little snow or rain? Global Warming! Snow and rain just right? Not for long…. Global Warming!. Global Warming, the answer to all questions. Except one: what to do about Global Warming!, The answer there is the redistribution of wealth and dramatic lowering of western living standards by a global government with powers to control all aspects of life and commerce. Funny how fascism is always the answer to any question. The first three figures are anomaly, while the second two are of temperature. Of course they differ greatly. The three anomaly figures are not from models, they’re from analysis of data — satellite data + ships + buoys for the first two (the RTG) and satellites only for the third. The two RTG analyses are computed against the 1961-1990 climatology. (Findable, though not easily, at the site). It’s ironic that the October figure is being pointed to. At the time, there was mention in the media that Sandy was made more severe by the anomalously warm ocean temperatures. Since the ocean was, again/still anomalously warm, for this storm, the connection is yet again pointed to. I dunno. As someone who experienced both the Blizzard of 67 and Blizzard of 79 in Chicago, both of which were fueled by anomalously warm Lake Michigans (i.e., they weren’t ice covered at the time), It seems pretty obvious that if the water source is warmer than usual, you get stronger than usual storms. The scope over which the ocean (or Great Lake) needs to be warm to produce an anomalously strong storm is just the storm scale. Whether the central or eastern Atlantic are colder than usual doesn’t really matter to a storm coming up the east coast of the US. What matters there are the continental slope waters (from the Gulf Stream in to the coast), which are clearly shown to be warmer than usual. Be all that as it may, the RTG folks have recently issued invitation (see http://moregrumbinescience.blogspot.com/2013/02/time-to-go-do-some-science.html for my writeup of their invitation, with, of course, link to the actual site and request.) for people who live near water to take observations to help improve the analysis.